My name is TimeCaptain and it has been 3 and 1/2 years since my last Panerai. Since then, I have been all over the map in terms of watch collecting (or binging). But my latest acquisition has brought me right back to the beginning of my passion – a passion that spawned my blog. In fact, my new Panerai is very similar to my last Panerai, which ended up disappointing me. And my new PAM is seemingly inferior to that last PAM in a couple of key areas. So what happened? What triggered this move? I‘m glad you asked. My passion (or obsession) with Panerai began in 2010 when I got my first smartphone and downloaded a watch catalogue that featured some PAM‘s. I thought they were plain, boring and expensive – until I started dealing with a guy who had a 111. I was captivated by that thing. Its beauty and wrist presence was breathtaking. That was the beginning of the obsession. 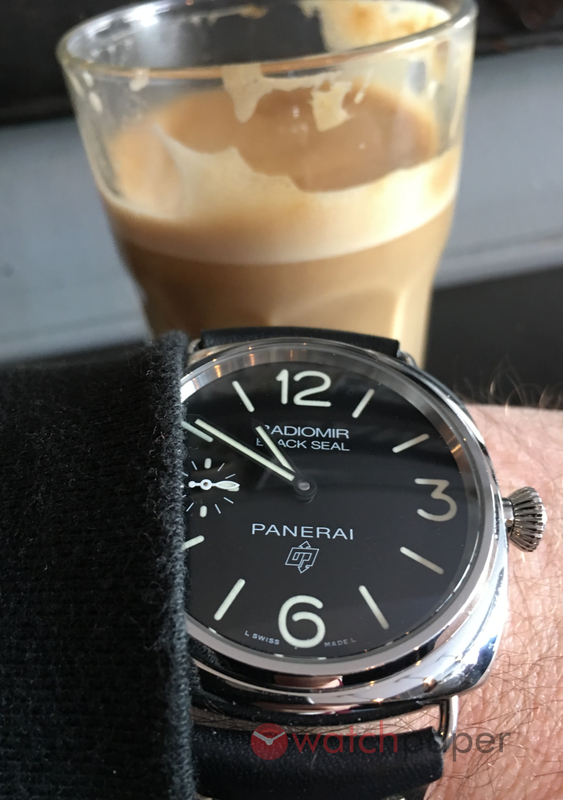 If you have read my recent blogs, you will think that I was over Panerai. At least, I was trying to convince myself that I was over Panerai. But without a Panerai, there was a void in my collection. I thought I could find substitutes and I did, actually, discover many amazing watches. I love these watches, too, and I will never pretend like it‘s Panerai or nothing. But man, I was dying to get back into the Paneristi again. A passion for racing watches originally brought me into this hobby and I have since developed a love for dress watches. Panerai, however, still holds something special for me. As you probably know, Panerai made the diving watches for the Italian frogmen way back in the 1930s. Some of these early watches used Rolex pocket watch movements. The seductive style of the Panerai you lust over today was born out of the military requirements of yesteryear- luminosity, legibility and robustness. Then, you probably know all about how Sylvester Stallone took Panerai to huge mainstream popularity in a 1990‘s action film. Today, Panerai embodies Italian style and Swiss watchmaking excellence. The watches are designed in Milan and produced in Switzerland. While respecting the roots of the brand, Panerai has pushed technology and design by developing exotic new materials and high tech processes such as 3D printing. Whereas Panerai used to rely on suppliers for its movements, it now produces all of its own movements, including some real high complications. Panerai has become a true manufacture. And Panerai is a status symbol. Panerai watches are very expensive- even by luxury watch standards. They are not easily attainable. Around the office, among my watch enthusiast friends, Panerai was the object of desire. Just as young boys dream of a Ferrari, young men often dream of a Panerai. The bold, simple, distinctive style of a PAM is very attractive to a young professional trying to make a statement. Never underestimate this factor. Making a statement was always a big part of my Panerai obsession. Is this vain? Does it show some kind of insecurity or inferiority complex? I am quite sure that it does. But it is also the truth. While I loved the Panerai legend and history and their gorgeous timepieces, I also craved a piece that would show some sort of prestige. Today, I am older and wiser and I realize that most people will never notice your watch anyway. Even so, that desire for something exclusive and enviable is still there. I focus primarily on the attributes of the watch these days, but I still like to have some wow factor in my watch box. In my circles at least, any PAM on your wrist puts you at the top of the watch chain. So we have established the appeal of the Panerai brand (for me anyway). The brand has an unusual history rooted in utilitarian military requirements and their watches have a seductive, instantly recognizable style. And any PAM is a highly coveted item by many groups of watch enthusiasts. The style is Italian while the watches are built with Swiss precision. 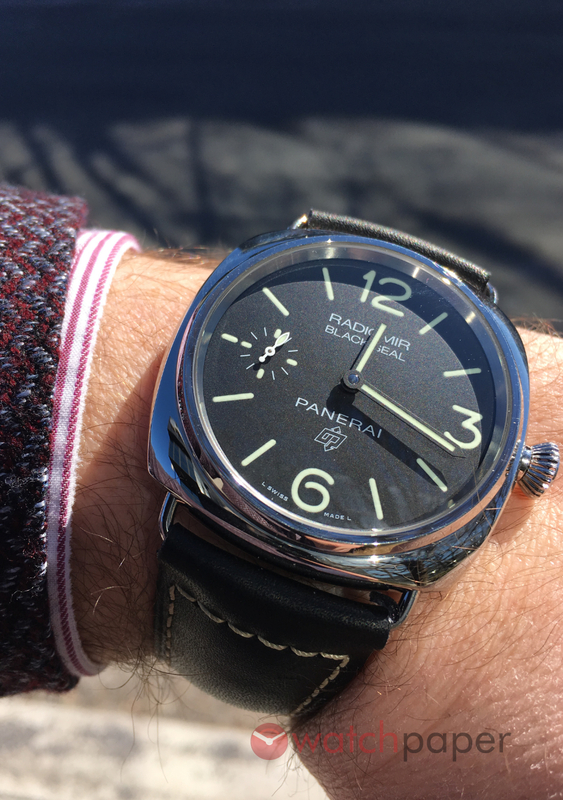 So what about this particular Panerai, the PAM00754? In 2018, Panerai launched a series of new entry-level watches. These watches are powered by a new, in-house calibre P.6000, boasting 3 days of power reserve. First came the Luminor Base Logo watches with reference numbers PAM00773, 774 and 775. Then came two Radiomir models, PAM00753 and 754. While all of these watches are entry level by PAM standards, they also ooze Panerai DNA- classic dials, classic sizes and manually wound movements. I was instantly attracted to all of these watches. First, their prices are almost accessible. But more importantly, these watches are beautiful and typically Panerai while using a new movement. My choice of Radiomir is as much about opportunity as preference because the 754 was simply the first P.6000 model that I could get my hands on. It is, however, still an obvious choice for me. The Radiomir came before the Luminor and was used by the Italian navy frogmen. To make the watches glow in the dark, radium was used and the paint used to apply the radium was called Radiomir. This dangerous substance was eventually banned and Radiomir was replaced by Luminor. 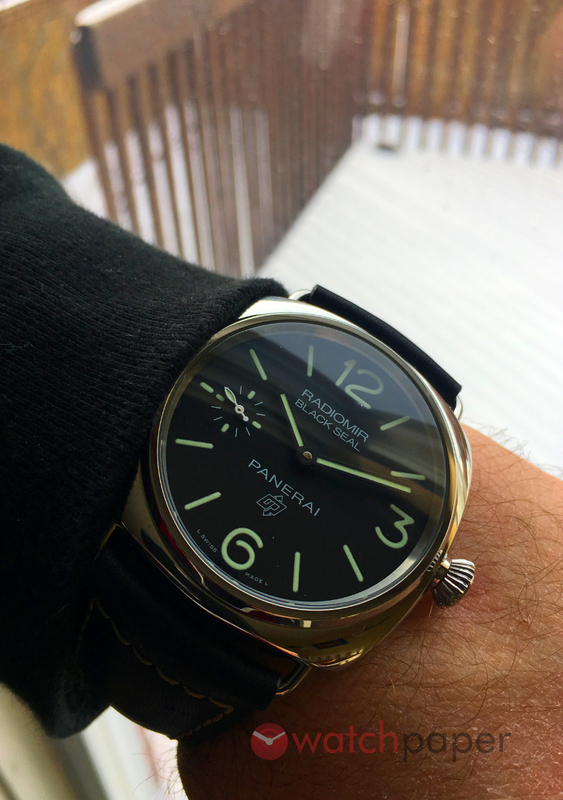 So you could say the Radiomir is the more classic Panerai. Mine is the Radiomir Black Seal Logo 3 Days Accaio. “Black Seal“ refers to the black suits worn by the Italian frogmen in the 1930‘s, which gave them their Black Seals nickname. “Logo“ refers to the “OP“ logo on the dial, which stands for “Officine Panerai.“. The logo‘s arrows, pointing up and down, represent underwater products and the products Panerai made for use in landing aircraft. “3 Days“ refers to the power reserve of calibre P.6000 and “Acciaio“ means steel (I.e. stainless steel case). My 754 is, therefore, a simple watch that expresses a lot of Panerai history. On the wrist, the Radiomir is elegant. It does not feel like a dive watch at all- even with its 45mm case. The slim case and wire lugs are very dressy. The wire lugs, of course, are a throwback to those old watches that were made by soldering lugs onto pocket watches in order to attach a strap. The lugs look cool, but their straps are far more difficult to change than those on a Luminor. Even at 45mm and with those wire lugs sticking out, the Radiomir has fit under every shirt cuff that I have thrown at it- even the tightest ones. This has allowed the 754 to become my default go-to business timepiece. The gorgeous, elegant style and the manual movement are a superb combination for a dress piece. And while it functions as an elegant, dressy piece, the 754 also tells the world that it is undeniably a Swiss-Italian Panerai masterpiece. When you wear a watch with no minute markers at every single minute, you get a “quiet“ kind of feel. This effect is more pronounced with a base dial like the 753, but even with a small seconds, the 754 tells time in a “quiet“ manner as you read the time in between 5-minute increments. This is something you notice after wearing the watch for a few days and I like it a lot. It adds to the character of the watch. Critics of the new Radiomir models will cite their painted dials and solid case backs as areas of inferiority versus earlier models. My 183, for example, had an exhibition case back and the revered sandwich dial. The 754 counters with that new P.6000 movement. Like most Paneristi, I would prefer the sandwich dial and see-through case back. When the 754 is on your wrist, however, you forget those details because it is just so beautiful. It looks “Panerai“ regardless of those details and has a huge wrist presence. The 754 performs as you would expect. It runs 3 seconds fast and holds more than its stated 3 days of power reserve. Winding the watch is a lovely experience. You unscrew the onion crown and then it winds in a crisp and purposeful manner with a nice sound. I have owned PAM with the old ETA Unitas 6497 movement that did not hack. I would try my best to sync the minutes hand with the moving seconds hand. And when I clicked the crown back into place, the minute would jump out of position and ruin my fine adjustment work. The P.6000 movement hacks, allowing you to hold the seconds at 0 while you line up the minute hand- ideally at a 5-minute interval so you can line up the hand with the markers. And when you click the crown back in, there is no stutter whatsoever. The minute hand stays right where you set it. The P.6000 is really a pleasure to operate. I work in an office environment, so I really appreciate watches that fit well with business suits. In the 754, I find a watch that tells the Panerai story while blending perfectly with my business attire. The 754 looks and feels like a Panerai, but with a more refined package than some of the other models. The classic Radiomir case is not for everybody, but it works wonderfully as a business statement piece. The 754 can play the casual role, too, but it feels best suited for dress shirts. You might even call it The Gentlemen’s Panerai.